The EBC held the 4th Meeting of its Board and Industry Board in 2015 in Brussels on 25/26 November. On this occasion, delegates from EBC’s member organisations and industry partners discussed the ongoing activities of the organisation and plans for the months to come. New member: A letter of membership application from the International Brain Research Organization (IBRO- PERC) was reviewed and presented during the Board meeting. Herewith, EBC is delighted to announce that IBRO has become an EBC member organization. Call to ACTION & Launch of Polish Brain Plan: The outcomes and next steps for the Call to ACTION were presented and received very positively by the Board. The need to disseminate and support the Call to Action further was emphasized. In this light, EBC members were asked to distribute and promote the initiative further. Consensus Document on Brain Research in Europe: The draft for a new “Consensus Document on Brain Research in Europe”, which was presented at the last Board meeting in September, was carefully reviewed and unanimously approved by the Board of EBC. 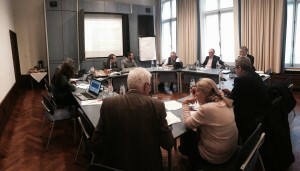 Workshop on ‘European Neuroscience Population Strategy’: Outcomes of the workshop? That was held the week before, were presented to the members and received very positive feedback as well as possibilities for involvement. The abstract of the workshop will be finalized and disseminated among members for further contribution. Value of Treatment: A progress report on the development of the “Value of Treatment” study and further recommendations were discussed. The roundtable meeting- which was initially scheduled to take place on the 25th November, had to be postponed due to the ongoing situation in Brussels. The opportunity to meet on another date was discussed and will be communicated to EBC members shortly. In addition to this, a presentation was provided by FIPRA in order to update the Board of EBC on the progress made with the seminars and advocacy on the “Value of Health” to which EBC contributes. STOA survey: Regarding the survey conducted on behalf of STOA, a greater push had been made in order to improve the collection of data. The countries still lagging behind the set objective were Germany and Belgium. Further support from EBC Members was therefore requested as it is crucial to get these in order to move forward to the next phase. The EBC office also presented its new website which was launched on 17th November as well as the reflection process for developing a communication strategy. Overview of current and proposed projects: The Board reviewed the projects in which EBC is involved currently and emphasized, in particular, that the outcomes of the two projects coming to a close (Advance HTA & NERRI) will be presented and discussed during the next Board meeting in February. The Board of EBC also confirmed EBC’s involvement in a few proposed projects. EBC’s governance: On a more formal note, the Board discussed its upcoming elections and the call for candidates for the four positions that will be open. Applications of potential candidates will be reviewed & presented in February when the Board meets again. Nominations were also requested for the delegates that will represent the Industry Board to the Board of EBC. Last, a call was made to the Members of EBC to nominate their delegates to represent them on the Board and General Assembly as well as a deputy. EBC would like to take this opportunity to thank the delegates present- both in person or online- for their contribution to these meetings, in spite of the exceptional circumstances in Brussels.